Hens and Chicks- you can grow that! My wonderful mother in law introduced me to Hens and Chicks-official name is semper vivem, which means live forever, and they do live forever. 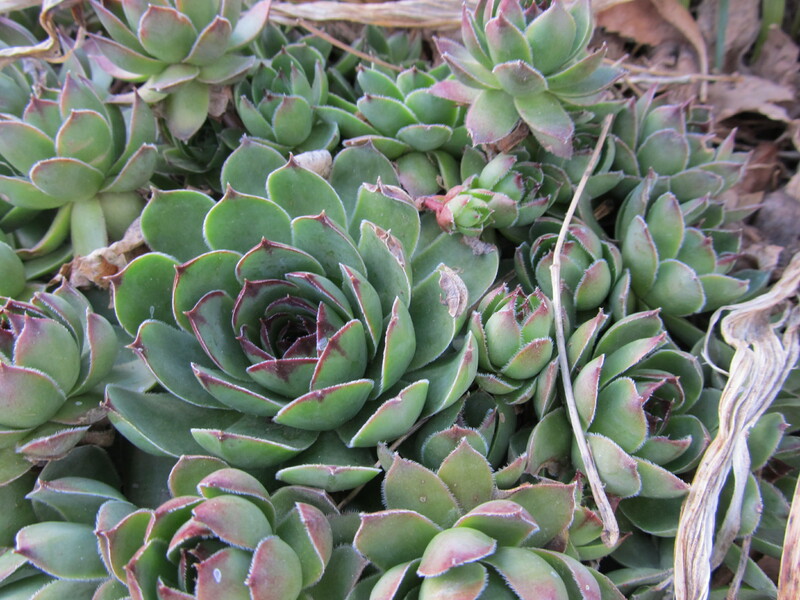 It is a succulent plant, with fleshy leaves that grow in a low rosette. The only thing that will kill these things is too much water- I love them for their ground covering ability. I can plug them into mulch and they will spread- each little rosette will grow offsets all around it. That is how it got its common name, someone saw the big plant as a mother hen, with baby chicks underneath. You can break off every offset baby plant, stick the stem into the ground, and it will take root and grow. I have covered a lot of ground with hens and chicks. I struggle with hanging baskets. I love the way they look, but I never remember to water them. Enter the Hens and Chicks! A week ago, I pried up a clump of them, and plopped them into a coir lined basket I had planted last year (with something that died, because I had forgotten to water it…) The offsets will dangle over the side, and the big green rosettes are just at eye level on my patio. If you do not have an obliging mother-in-law, (and, believe me, I am not in any way suggesting that you choose a spouse based on the gardening abilities and generosity of his or her mom, but, think about it, how else should you decide? Kindness? Attractiveness? Sense of humor? Bah!) then by all means buy some sempervivems at your local garden center and let them spread. They don’t take much foot traffic, but they look great on the edges of things, near paths, or in the corner of a bed, by a gate, where the sprinkler doesn’t reach. Hens and Chicks! You can grow that! Viva sempervivem! Genius! L.A. instilled a newfound love of succulents in me. Do they need full sun or do they do well in shade? Beautiful and many varieties are hearty to zone 3! Great indoors and out!